We Remove Ice Dams & Roof Snow in Wellesley MA. Make It Difficult To Stay Dry. Looking for Wellesley Ice Dam Removal help? 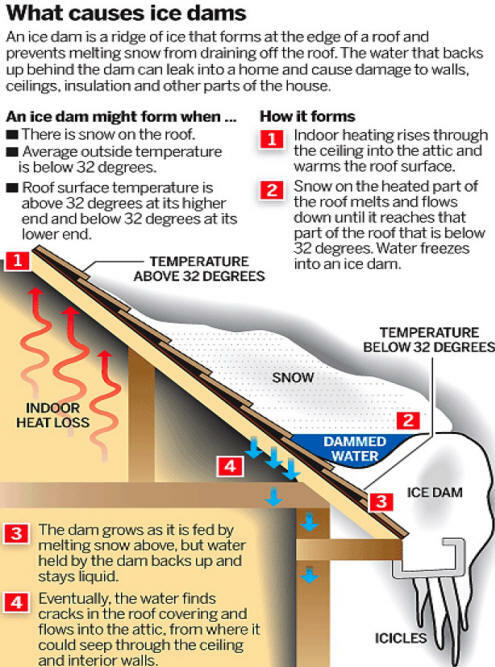 When an ice dam forms at the edge of a ridge and prevents the melting snow from draining as it normally would, it can cause a number of problems. When this occurs water can back and leak into your home causing damage to your ceilings, walls, floors, insulation and many other areas. Often times a thick accumulation of snow is the root cause of an ice dam, yet it takes only a small amount for this situation to occur. Wellesley Ice Dam Removal Specialists, Pinnacle Exteriors Inc. offers only the safest techniques when it comes to removing an ice dam. Proper tools coupled with years of knowledge results in dam removal, damage free. Removing the problem does not stop there, we are able to show you how to prevent future ice dams from occurring as well as show you warning signs that an ice dam may be forming on your Wellesley Massachusetts residence. Have More Questions About Our Wellesley Ice Dam Removal Services? Call Pinnacle Exteriors Inc. at 617-237-2855, to speak with our Wellesley Ice Dam Removal Specialists or to schedule a free Wellesley Ice Dam Removal estimate. Part of Greater Boston, the town of Wellesley is a town in the Norfolk County of the State of Massachusetts. The town has one of the highest standards of living as well as one of the highest household and family incomes in the state. The population of Wellesley as of today stands at a 27,982, a rise in population of around 5.1% from 2009. The town of Wellesley has had a rail service running through Boston from 1833. The rail service these days is provided by the MBTA which gives the town 17 commuter railway trains inbound to Boston and the outbound towards Worcester and Framingham on weekdays. There is also the MWRTA bus service system that runs along Cedar Street, Walnut Street, and Route 9. The most important roads and link roads that connect Wellesley to the rest of the cities in the neighborhood and downtown Boston include the Massachusetts route 16, Massachusetts route 9, Massachusetts route 135, Massachusetts route 128 which are all part of the Interstate 95 highway.